This stylish catamaran offers a unique holiday experience with a family-friendly atmosphere. Relax aboard the MY Pegasus and enjoy visiting fantastic destinations all over the world! 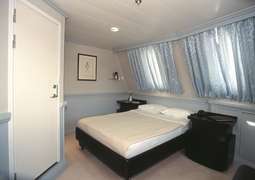 The accommodation on board the MY Pegasus is both comfortable and welcoming. 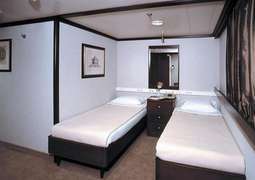 There is a choice of inside or outside cabins which are complete with elegant and comfortable furnishings. The beautiful nautical atmosphere in the cabins stems from the presence of portholes and windows allowing you to get a good look at the passing scenery. Your cabins feature a double bed or twin beds, a shower with toilet, adjustable air conditioning, radio, telephone and TV. In the large, classy restaurant on the upper deck of the MY Pegasus you can dine in style and enjoy a wonderful view of the passing scenery thanks to the large windows. The skilled kitchen staff offer culinary delights from local to International delicacies. If you would prefer to dine al fresco then you should visit the open air restaurant on the sun deck. It is possible to have a vegetarian option or specialist diet if you make a request in advance. The MY Pegasus is perfect for enjoying sunny weather and the large, partially sheltered sun deck allows you to relax while looking out at the calm blue ocean. The elegant lounge on he MY Pegasus is the most popular location to have a nice and relaxing time. The destinations which the MY Pegasus visits span across areas where one can go kayaking and snorkeling, and allow you to experience the underwater worlds (as well as those on shore!) There is also the chance to sail and optional excursions to get to know the locations even better. The MY Pegasus also has a platform which gives you direct access to the sea.